Palestinian prisoners in Israeli jails have agreed to end a mass hunger strike, which has been going on for more than two months. More than 1,500 Palestinians have been refusing food to demand an improvement in conditions. Under a deal, Israel conditionally agreed not to renew detentions without charge, which had been a key grievance. The protest had raised fears of a violent Palestinian backlash if any of the inmates died, correspondents say. "All of the factions signed an agreement," Qadura Fares, head of the Palestinian Prisoners Club, told AFP news agency. The Israel Prisons Authority later confirmed the deal, which was brokered with the assistance of Egypt and Jordan. It said the prisoners would now sign a commitment "not to engage in actions contravening security inside the jails", according to Reuters. An Israeli government spokesperson said the deal was clinched after a formal request from the Palestinian leader Mahmoud Abbas. The Palestinian inmates went on hunger strike to protest against the so-called "administrative detentions" - the policy of detention without charge or trial. The deal envisages that such detentions can no longer be extended for another six months if no new evidence emerges, in what is seen as a big concession by Israel, says the BBC's Jon Donnison in Jerusalem. It means that more than 300 prisoners could all be freed by November. Such detentions have been condemned by the Palestinian Authority, which threatened to take the matter to the United Nations. The inmates have also complained about being kept in solitary confinement and being denied family visits. An Israeli government official confirmed that more family visits would be allowed from prisoners' relatives living in the Gaza Strip, but denied that Israel had agreed to no more solitary confinement for inmates. 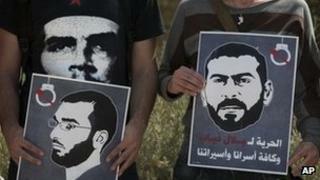 Many of some 4,500 Palestinians held by Israel are suspected of being members of militant groups. But they are seen as heroes in the West Bank and Gaza, where there have been protests in solidarity with the prisoners.